When I got my Rachel Ray magazine in the mail, I was flipping through it when I came across the Caramel Apple Cupcakes. These looked so good I knew I needed to make ’em. However, I am more of a cake mix girl rather than a from-scratch cake kinda girl most days. So, I thought maybe I could create my own recipe with a cake mix. And boy did these Caramel Apple Cupcakes turn out good! Don’t you just want one now? I started with a spiced cake mix and figured I could just add the shredded apples to the mix. But the trick, how much of a reduction in water would I need? The cake mix called for 1 1/4 cup water, 1/3 cup oil, and 3 eggs. I reduced the water by 1/2 cup and added two skinned and shredded apples. Mixed all the ingredients together. The recipe says it makes 24 cupcakes. They lie. I filled my cupcake papers a little too full, but at most I would have 18. Make sure you don’t overfill! Bake them for 25-30 minutes on 350 degrees. I was smooth enough to run out of gas to the oven about 2/3 of the way through the cooking process. Luckily, the oven kept the heat pretty well and by the time we got the gas switched to a full tank, there was no harm done. Let the cupcakes cool and make the caramel topping. Take 1-1 1/2 cups of caramels and melt them in the microwave. Add enough half and half to make smooth. Now, my friend Liz over at Two Maids a Milking showed up just in time at my Pampered Chef party to help do this part. I would have made a huge mess trying to get the caramel on the cupcakes, but Liz is so much wiser. 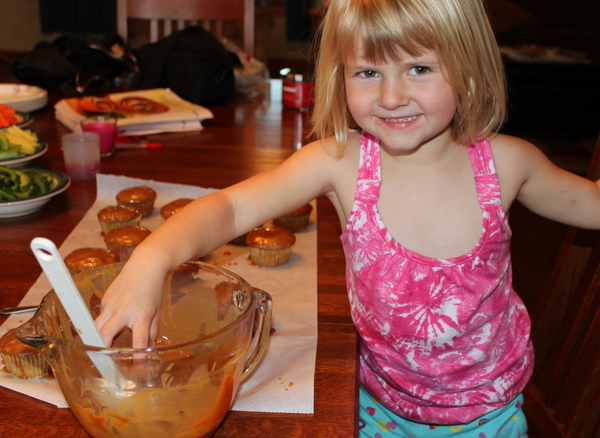 She enlisted Princess to help dunk the top of the cupcakes in the caramel. She had fun and Liz saved me from a huge mess. And everyone enjoyed them! Caramel Apple Cupcakes recipe is a semi-homemade cupcake that combines a spice cake mix with fresh apple and a caramel topping for the cake version of caramel apple. Mix the cake mix, apples, water, oil, and eggs together. Line cupcake pans with liners and fill up 2/3 full with batter. Bake on 350 degrees for 25-30 minutes. Melt caramel pieces and cream together in the microwave 30 seconds at a time until completely melted. Dip each cupcake into the caramel. Do you have a great fall recipe? Let Gooseberry Patch know about it here! Find other great recipes at the weekend potluck and Monday meal plan. « Farmer Friday: How did I get here? Well you could just host the semi-homemade television show and I think cake mix is the way to go. I just loaded up in my pantry with Betty Crocker cakes mixes on sale for 99 cents so I am game to try this recipe and I have a couple of helpers to dunk the cupcakes! Great recipe Leah! They were the hit of the party! And I think I had just as much fun as princess did! Oh my!! These look and sound delish! And a card? Fab! Thanks for linkin up to tasty tuesdays. They sound (and look) delicious! Spice cake mix is the best. Yummy cameral-y cup cakes! It makes me eat plenty of it. I should stop dieting before eating these delicious cup cakes. I will try this recipe by weekend. The kid’s wills surely love this. Thanks for the recipe. Great photos and I love your blog. I also entered my Fall recipe with Gooseberry Patch. Good Luck to you. This sounds sooo good! I love spice cakes and caramel, yummy!! I would be licking the bowl for sure, mmmmm. Those are very caramelize cupcakes. Lol. I love the sticky texture of caramel and adding to cupcakes makes it the best. Thanks for this recipe. Def will have to make this soon. Radeti voi radeti, dar William Brinza va castiga detasat alegerile din diaspora. Majoritatea romanilor ii poarta o enorma simpatie pentru tot ceea ce a facut.